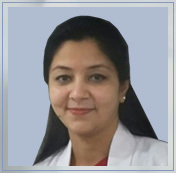 Dr. Archana Trivedi is a consultant obstetrician and gynecologist with 17 years of work experience, including having worked abroad in U.K and Maldives. MRCOG from Royal College of Obstetrician and Gynecologists, London, UK in 2008. Research in ‘Role of Zinc in Female Infertility’. Presented Paper and won the Gold medal at the 12th Annual Conference UPCOG.